Investigation: How Russia Acquired US Uranium – Endangering The National Security Of The United States. In this investigation, I first want to start with Hillary Clinton’s interview published on Dec 25, 2014 with Vladimir Pozner of Russia. She speaks about the successful reset she has made between Russia and United States. I am having trouble with YouTube today, so I hope you will be able to view this video. There is quite a bit of talk right now about Russia being able to acquire United States uranium, as Russia has a goal of attaining the largest supply of uranium in the world. Why else would Russia purchase this uranium when it has its own supply? As a CFIUS member, Hillary could have heeded this warning and stopped Vladimir Putin from controlling a fifth of U.S. uranium supplies. However, it was passed by CFIUS. Three days later, according to the Washington Post, “Boeing formally submitted its bid for the Russian deal.” On June 1, 2010, the Kremlin-owned Rostekhnologii company — mercifully, it’s now called Rostec — had great news for the plane maker: It decided to buy as many as 50 Boeing 737 jets for Russia’s national airline, Aeroflot. Reported price: $3.7 billion. That August 17, just ten weeks later, Boeing announced a $900,000 gift to the Clinton Foundation to “help support the reconstruction of Haiti’s public education system” after a massive earthquake pulverized the impoverished nation the previous January. The Clinton Foundation’s website declares total contributions from Boeing to be between $1 million and $5 million. This is the biggie here in my opinion: “Clinton did not point out that, to secure the donation, the State Department had set aside ethics guidelines that first prohibited solicitations of Boeing and then later permitted only a $1 million gift from the company,” Rosalind S. Helderman explained in the April 13, 2014, Washington Post. “State Department officials ruled out soliciting Boeing and other large firms with significant business relationships with the government.” These authorities then changed their minds and permitted Boeing’s contribution, although no one can explain how Boeing shattered that $1 million ceiling. Clinton always seemed to get her way. I can see how the life she is living now must be such a disappointment and failure for her. She claimed in the interview in Russia, family came first for her. She now has a chance to prove it. The chart at http://www.nytimes.com/interactive/2015/04/23/us/clinton-foundation-donations-uranium-investors.html helps to explain so much of this story. Also, I want to quote a Wikipedia source on Uranium One: In 2007 Uranium One acquired a controlling interest in UrAsia Energy, a Canadian firm with headquarters in Vancouver, from Frank Giustra. I would like to insert here Frank Giustra is a man who has been involved with the Clintons for years. UrAsia Energy has interests in rich uranium operations in Kazakhstan. UrAsia Energy’s acquisition of its Kazakhstan uranium interests from Kazatomprom followed a trip to Almaty in 2005 by Giustra and former U.S. President Bill Clinton where they met with Nursultan Nazarbayev, the leader of Kazakhstan. Substantial contributions to the Clinton Foundation by Giustra followed. The Podesta Group then lobbied on behalf of Uranium One. The Podesta Group is run by Tony Podesta, the brother of John Podesta who was Hillary Clinton’s 2016 campaign manager. NOTE: The Podesta Brothers are involved here. In June 2009, the Russian uranium mining company ARMZ Uranium Holding Co. (ARMZ), a part of Rosatom, acquired 16.6% of shares in Uranium One in exchange for a 50% interest in the Karatau uranium mining project, a joint venture with Kazatomprom. In June 2010, Uranium One acquired 50% and 49% respective interests in southern Kazakhstan-based Akbastau and Zarechnoye uranium mines from ARMZ. In exchange, ARMZ increased its stake in Uranium One to 51%. The acquisition resulted in a 60% annual production increase at Uranium One, from approximately 10 million to 16 million lb. The deal was subject to anti-trust and other conditions and was not finalized until the companies received Kazakh regulatory approvals, approval under Canadian investment law, clearance by the US Committee on Foreign Investments, and approvals from both the Toronto and Johannesburg stock exchanges. The deal was finalized by the end of 2010. Uranium One paid its minority shareholders a significant dividend of 1.06 United States Dollars at the end of 2010. We must note again Hillary Clinton sat on the US Committee on Foreign Investments, and many questioned how this passed so quickly: Sen. Charles Grassley (R-IA), in a June 30, 2015 letter pointed out the for a matter of such importance, nearly 25 percent of the country’s uranium deposits, and how the transaction was approved so quickly. 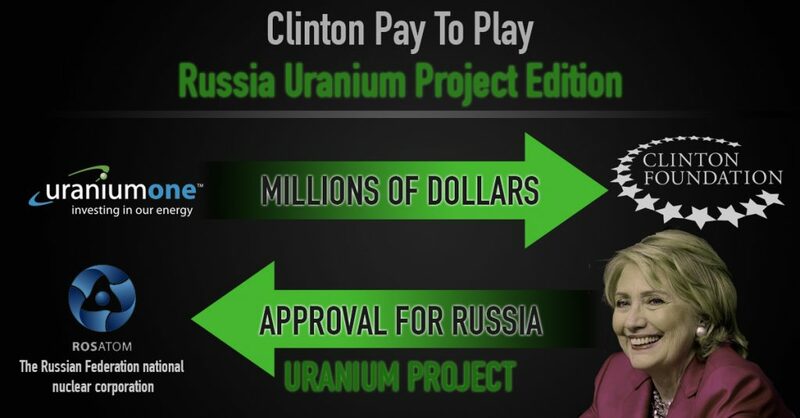 “On April 23, The New York Times reported on details regarding the Clinton Foundation’s ties to a number of investors involved in a business transaction that resulted in the acquisition of Uranium One, owner of U.S. based uranium assets, by Atomredmetzoloto (ARMZ), a subsidiary of Rosatom, a Russian government owned company. The transaction raised a number of national security concerns because it effectively ceded 20% of U.S. uranium production capacity to the Russian government. Due to that foreign involvement, a review of the transaction was conducted by the Committee on Foreign Investment in the United States (CFIUS), whose membership includes the Secretary of State and of which Treasury is the chair. In addition, during critical stages of the acquisition approval, interested parties made large donations some in the millions of dollars to the Clinton Foundation while Ms. Hillary Clinton held the position of Secretary of State. When millions of dollars flow to decision makers who have substantial discretion to provide support for or against approval of controversial transactions, public confidence in the integrity of the process requires a commitment to transparency and responsiveness to oversight inquiries. In light of the gravity of the decision to allow a Russian takeover of almost a quarter of U.S. uranium assets, it is in the public interest to determine the facts and circumstances of the transaction, including any potential donations that could have influenced the CFIUS review process. The purpose of CFIUS is to ensure that national security is not undermined by transactions that result in control of a U.S. business by a foreign person. THE NEW YORK TIMES (April 23, 2015). See also, Uranium One to Nuclear Regulatory Commission, January 29, 2013. I want to point out I had no knowledge of the following story, but when I read it in the National Review I was shocked and knew it had to be discussed here now: Hillary Clinton became interested in Skolkovo, an “innovation city” near Moscow, which enjoyed some $5 billion in Russian-government seed money. She discussed Skolkovo with Russia’s then-president, Dimitry Medvedev. “At a long meeting I had with Medvedev outside Moscow in October 2009, he raised his plan to build a high-tech corridor in Russia modeled after our own Silicon Valley,” Hillary said. “When I suggested that he visit the original in California, he turned to his staff and told them to follow up.” Oh, Hillary, how proud you must have been! The month before Medved’s June 2010 visit to Silicon Valley, the State Department arranged for 22 leading U.S. venture capitalists to tour Skolkovo. Under Hillary, State encouraged American companies to participate in the Skolkovo project. Cisco, Google, and Intel are among those that got involved. This is extremely interesting. If Trump had did something like this, well, can you imagine? The Skolkovo project paid off well for the Clintons: 28 “Key Partners” in the U.S., Europe, and Russia. Among these major supporting organizations, three-fifths had donated or pledged funds to the Clinton Foundation or paid speaking fees to Bill Clinton. According to From Russia with Money, an August 2016 study by the Government Accountability Institute, these 17 “Key Partner” entities donated between $6.5 million and $23.5 million to the Clinton Foundation. A Russian funded, Moscow-based technology organization has been discovered to have given tens of millions of dollars to the Clinton Foundation during then-Secretary of State Hillary Clinton’s tenure, according to a bombshell new report. As President Obama’s top diplomat, Clinton oversaw and facilitated the State Department’s failed five-year project to “reset” U.S.-Russia relations, which spurred the creation of Skolkovo, a research facility known as Russia’s version of Silicon Valley. The amount of money given to the foundation from “key” Skolkovo partners ranges from $6.5 to $23.5 million, according to Clinton Foundation data. The foundation only discloses donations in ranges, making it difficult to track the exact amount. The FBI and U.S. Army determined that Skolkovo had transformed into a “dangerous pathway” for Russian technological espionage and boosted the military’s technological capabilities. Many Skolkovo research projects used “dual-use” technologies, meaning the operations have both civilian and military uses, the report said.Among Skolkovo’s technological innovations were Russian hypersonic cruise missile engines, radar surveillance equipment, and vehicles built to deliver airborne Russian troops, Schweizer wrote in the Wall Street Journal. There is great irony in the fact that the Clinton’s collected millions from a Russian technology firm that could throw an election into chaos, yet blame President Trump for doing exactly what they did. In conclusion, I hope I have provided enough evidence to vindicate President Trump in his speaking of the Clinton deal with Russia regarding the acquisition of United States uranium. It is a long and complex story; nevertheless, it is a factual story with many curves and turns. Not only that we see that Hillary Clinton strived for forge a relationship with Russia to benefit herself and her Foundation. We also now have the Skolkovo Project as a further outreach showing she benefited from this, also, even alerting the FBI to the dangers involved. I have grown tired of reading accounts from outlets like Media Matters and David Brock, who are constantly on attack against President Trump and alt-media outlets trying to report the truth about this deal that benefited Hillary Clinton and John Podesta. It pushed me to investigate this “old” subject, as it is coming to life again. However, through this report, I have tried extremely hard to present factual data from trusted sources. I hope I have done that.